Looking for the Trio Motion Technology website? Click here. Motion Perfect v4 adds another dimension to Trio’s powerful and familiar programming tool! The 3D Machine visualization tool and 3D scope tool allows real-time simulation of your applications. Our easy-to-use cam generator has been added right into Motion Perfect allowing smooth curves to be created using drag and drop points. Trio designs and manufacture flexible and economical solutions for motion control applications, enabling control of complex high speed automation and machine control in most industries throughout the world. Our comprehensive range motion controllers branded Motion Coordinators allows seamless control of 1 to 128 axes of servo motors, stepper motors, piezo motors or hydraulic systems. 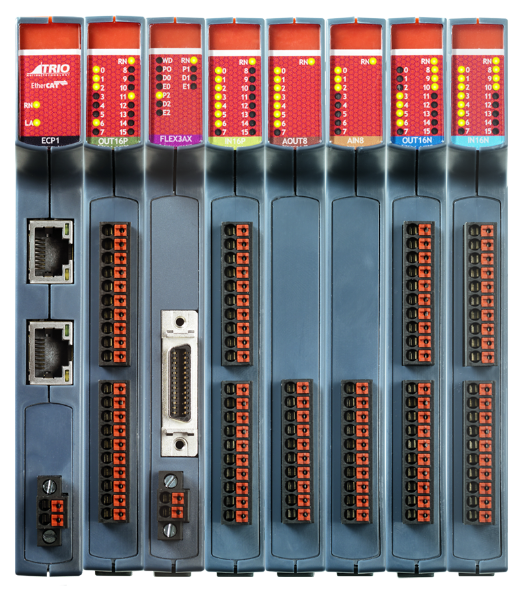 Our flexible, modular controller range uses a common user interface and standard programming language; TrioBASIC. 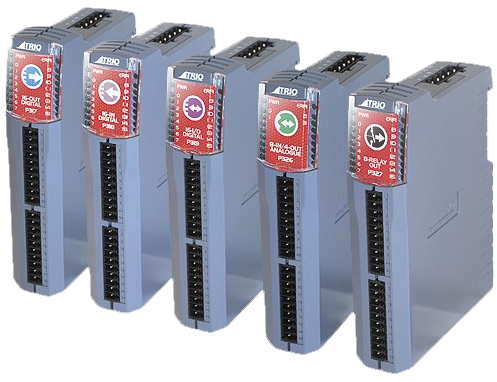 Trio’s Flexslice system is a powerful expandable I/O system specfically designed for use with Trio EtherCAT master controller, but are compatible with any master. The bus coupler supports up to 16 input/output modules which have a positive mechanical lock and bus connector, making a reliable EBUS connection through the backplane. The complete assembly can be DIN rail mounted. The coupler converts the passing telegrams from Ethernet 100BASE-T to EBUS signal format. 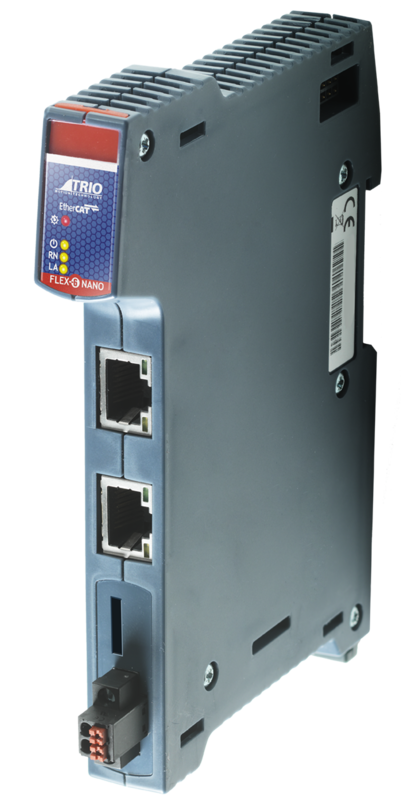 The Trio CAN16 Output module offers a compact DIN rail mounted output expansion capability for all non-EtherCAT Trio Motion Coordinators. Up to 16 P317 modules may be connected to the CAN network which may be up to 100m long. This provides 256 distributed output channels at 24Vdc level. The Trio CANbus I/O expansion can considerably reduce machine wiring and cost. Trio’s unique UNIPLAY HMI system is a revolutionary way to make operator interfaces better, easier and more secure! The UNIPLAY series boasts a 7″ and 10″ colour display. HMI The UNIPLAY range has built-in power isolation technology making it more reliable in noisy environments. Uniplay HMI’s work with the Trio 4xx Motion Coordinator range.